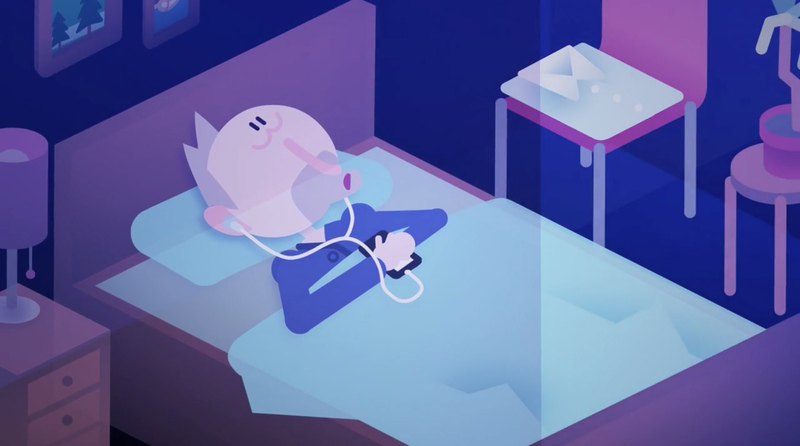 Channel 4’s Random Acts programme has become a trusted source for exciting new material here at DN, with the series of specially commissioned three-minute films throwing up recent favourites such as Karni and Saul’s Skinmeal, Cristina Molino’s Keep Dancing, Jeremy Cole’s Under the Knife and Griff’s Wish List. 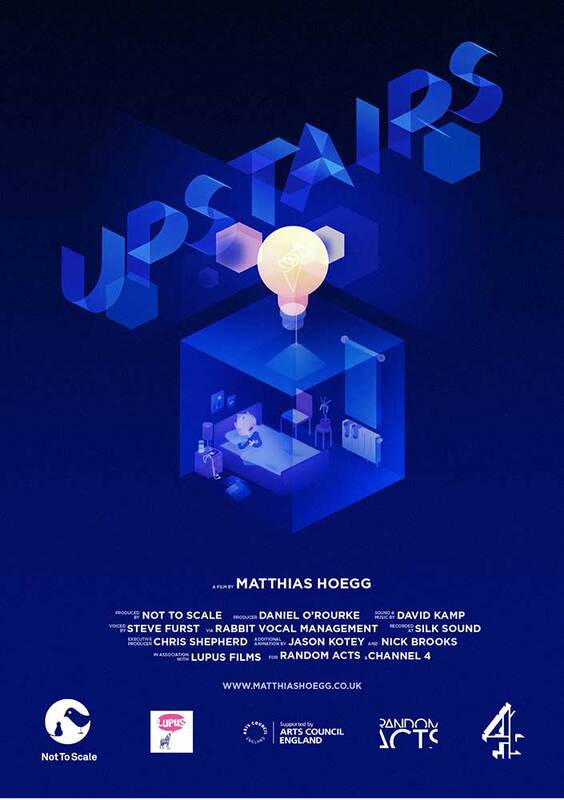 The latest film to grab our attention from the late night shorts schedule is Upstairs from DN alumni Matthias Hoegg. Never one to miss an opportunity to chat to a talented animator I caught up with the director to talk about his latest film, strange sounds in the night and creating short films for television. A short story about how much we know – or want to know – about the lives of our next door neighbours in urban flats. An inexplicable sound from the flat above leaves Jeff sleepless and anxious to find out the truth about what’s really going on upstairs. Your story revolves around a couple of neighbours living in a set of flats and seems to be a very universal tale that anyone who has lived in similar accommodation could relate to (I know I can) – where did the story for Upstairs come from and how did it develop into the final narrative? Although it’s not quite autobiographical, I definitely took some inspiration from years of living in tiny London flats surrounded by unknown neighbours and their strange sounds at night. I wanted to capture the eery situation when you can’t help wondering what your neighbour gets up to when their noises keep you up at night without ever getting a definitive answer. I think in most of my personal projects so far I’ve been interested in using a very mundane, recognisable situation and trying to elevate the drama of it through the artificial lens of animation. The overall structure with animated loops in isometric boxes was something that derived from a character workshop I did with students at the Kassel Art Academy in Germany one year earlier. The aim was to describe characters through 3 loops showing their everyday routines. In my story Jeff has no idea about the real identity of his neighbour so his imagination keeps jumping between different scenarios and one loop transitions into the next. My idea for this film was to come up with the sound effects first and then work backwards to come up with visuals to match them, in the same way that Jeff is imagining scenarios based on the sound he hears from upstairs. As you can see from the concept work I’m including here I tried a few different scenarios before I figured out what exactly the true source of the sounds should be. As with your previous work, the film has a very distinct visual style, what can you tell us about the production? I spent 2 months at Not To Scale in London animating the film mostly by myself with a little bit of help from other animators for a couple of scenes. Although it was a pretty intense amount of shots to animate in that time I felt very privileged to be able to dedicate a solid amount of time to a personal project. And working in a studio with the frenzy of a commercial being produced around me kept me on my toes. On a technical level I designed everything in Photoshop and Illustrator, worked out key poses drawing directly in flash and finally animated it all using a combination of Flash, After Effects and Maya. I really think After Effects is a great, intuitive tool, even for character animation. The film was made for Channel 4’s Random Acts series, how did creating specifically for that series affect your production? Did it place an extra level of expectation on the work knowing it would be screened on TV? Slightly optimistically I usually make my film with a bigger audience in mind and try to keep them accessible, even when they’re just released online – so working for TV didn’t really create extra pressure in that respect. But it did affect the way the story was told, especially the use of voice over to condense the story and make the situation as clear as possible within the short space of time available. I hadn’t really used any dialogue in any of my previous films so this was a new experience for me. My favourite part of working on the film was right before the end when Steve Furst’s voice brought Jeff’s character to life. As an animator I was used to things improving in tiny increments so it was incredibly satisfying to hear him put the whole character down in just 45 mins in the recording booth. The prolific David Kamp produced sound design and music for Upstairs, what does having someone like David onboard add to the production? Sound effects were obviously really key to the story of ‘Upstairs’, but his atmospheric sounds and small musical flourishes, strings and atmos also added a whole other layer of storytelling, especially towards the build up at the end of the film. It was good having to relay my ideas for each shot to him, and he’d sometimes challenge them, which was a good test so I could be clearer on what I wanted to say with each shot. What’s the plan for Upstairs now? We’re releasing the film more widely on Vimeo in a month’s time and I’ve planned out a number of festival submissions that I don’t want to miss. I’m curious to see how this unusual format does in festivals and have my fingers crossed.